A complete mechanical design toolkit, all in .dwg. Assemble freely using the power of 3D Direct Modeling. The parameters manager panel gives you one place to control all parameters in a drawing, with user-defined filters. 3D constraints can now accept geometric features as arguments. Also, the spatial position of these arguments can be controlled by flags. Parametric components, and component-based features can now be grouped into associative arrays. The included library of parametric standard parts can be linked to expressions to create entire libraries of workflow-specific parts. Assemblies can be automatically exploded in multiple ways. Exploded representations are created based on disassembly without collision. Changes made to an un-folded sheet metal part will propagate back to the original 3D sheet metal model. With BricsCAD V16 or later sheet metal designers can use a new type of junction called Full overlap, as well as two new corner reliefs (V-type and circular). With feature coloring you can easily distinguish one sheet metal feature from another and visually validate your sheet metal parts. Each of the sheet metal features – flanges, bends, junctions and reliefs – has its own assigned color. You can easily re-set colors in the settings menu. 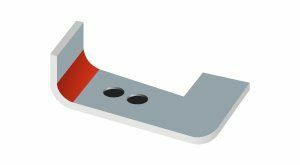 BricsCAD allows you to create sheet metal parts with lofted surfaces. Supported profiles include lines, arcs, circles, rectangles, polylines and splines. 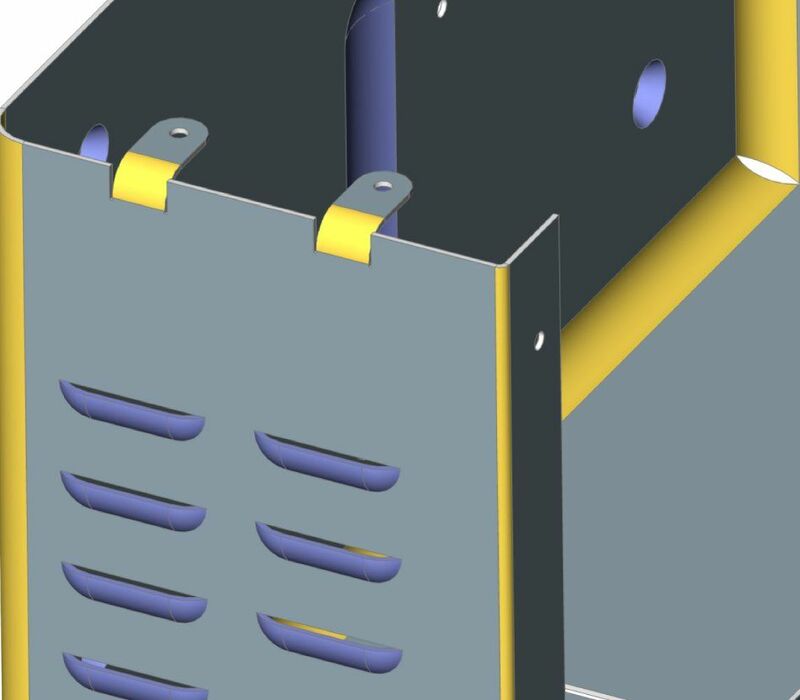 Imported sheet metal parts with lofted bends can be edited and unfolded. Batch processes of large numbers of sheet metal parts and assemblies can be automated using a dedicated LISP API. This automation feature accomplishes tasks, such as producing families of sheet metal parts of different sizes. Example LISP scripts are included with BricsCAD. Flange bend lets you bend an existing flange along a line, obeying the k-factor for given bend radius. The “k-factor” determines how much of the material’s thickness compresses and how much stretches during the bending process. When you import geometry, BricsCAD recognizes incorrectly-made bends and automatically repairs them. Features can be recognized in imported geometry and automatically repaired. All wrong bends are marked red in the sheet metal parts and the properties bar. “Form features” mimic the process when a forming tool deforms a piece of sheet metal. After the form is applied, you can edit it directly and parametrically through the Properties bar. The library contains most commonly used form features, such as bridge, louver, and emboss. You can import form features from other systems, and define your own custom forms. When you import geometry from other CAD systems, you can search for similar form features, and then replaced them with ones from your libraries. 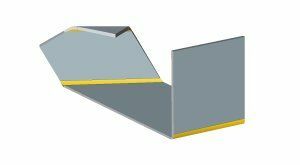 Create associative rib form features on sheet metal parts made from 2D profiles. These rib features update automatically when their defining profile changes. Import .csv files containing sets of parameter values. 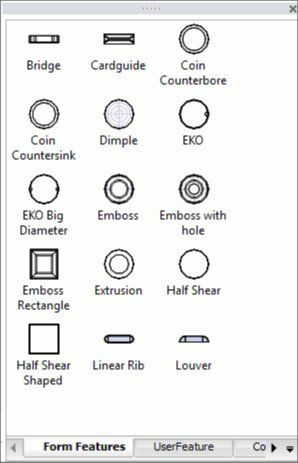 With these values, you can drive geometry to create families of 2D and 3D parts. These parameters are accessible from the Mechanical Browser in BricsCAD. BricsCAD already exports sheet metal parts in .dxf or .osm formats for prepping for CNC programming by JETCAM and LVD systems. BricsCAD also generates .dxf files for CAM systems by CYBELEC and DELEM.